I am glad you are not done with those oak leaves! I love their sound. And, there's something primeval about the glitter of that crow bead-eye. Wise and maybe even a little mischievous, too. one restore what’s been lost? I'll add a wow, too. That line, "my father" -- is he the stone that's fallen, or the one to whom you're addressing the question...or both? Thanks Kevin and Mary Lee. I'm trying to write some tanka and that line was to be the "hinge" that might work with either the upper strophe (is that what it's called?) and the lower one. The backstory is that I'm feeling the passing of the generations these days. What once seemed solid, crumbles with time. Poetry is a great way to think through this stuff, though, 'cause the words need to be just so. I "find myself" through words sometimes, so getting the right ones helps me understand. Does this ever happen to you? The beauty of nature and the evolution of the season is seen in your poem, Carol. Yum, Carol! I've heard of those machines that crank out the butter cookies, but I've never used one. Is this what you were thinking? I'm imagining a happy sound as the crank goes round and round. Mary Lee- Not sure why, but I always think of crows as males. I love the idea of a female standing up to her knees. And the bead eye. Steve- The imagery in this poem just kind of takes my breath away, again. The image of the stone, followed by my father and then that huge life question. 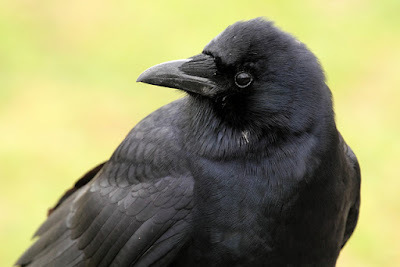 Mary Lee, your last line makes me wonder what the crow is thinking with his bead eye watchful glare.